I'm always amazed and delighted with the abundance of fruit in the grocery stores in the winter, and at very reasonable prices. Berries are my favorite and are so refreshing in the cold months. I have found watermelon, but it may be a little trickier to find. Substitute any other melon, or even strawberries, if desired. 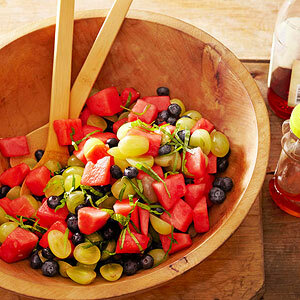 In a large bowl combine watermelon, grapes, blueberries, and basil. For dressing, in a small bowl whisk together vinegar and honey. Pour dressing over fruit; stir gently to coat. If desired, cover and chill for up to 8 hours.